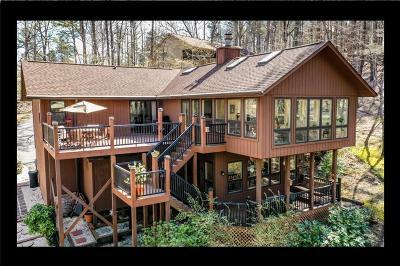 The drive to this home on Channel Lane offers some of the prettiest Blue Ridge Mountain views. Located in the cul-de-sac at the end of Channel Drive, this home is located on the golf course. The privacy and garden setting was one of the features that drew this couple to this home. The sunroom on both the main level and terrace level look directly at the golf course as well as their garden. This couple replaced the original deck with a new one that opens from their sunroom. They love sitting out in the evening and enjoying the quiet beauty of their home. There are some mountain views from the sunroom and deck. The main level features a freshly updated kitchen with the living room and dining room combining into a large entertainment area with wood floors and the fireplace and flows into the sunroom, which lives up to its name as there are three walls of windows looking out to the golf course. The lower level features a gathering room as well as a bedroom and full bath plus the second sunroom that is the home office for the owners. Beautiful setting! The information provided is believed to be accurate. Buyers and/or buyers agent to verify. This home is located in the premier gated community Of Keowee Key. The buyers will pay a one-time fee to Keowee Key at closing. There are annual HOA fees that are billed monthly as well as a restaurant minimum. The golf course is scheduled to reopen in the fall. The Clubhouse restaurant is nearing completion. The Bistro and Fitness Center are gorgeous! There are two private marinas, walking trails, a dog park, two outdoor pools, sandy private beaches, an amazing community of pickleball players and tennis enthusiasts. You will definitely be interested in this home!